Big Data Education MOOCs in Switzerland: New Media, New Access, New Perspectives? Our Work GPP Switzerland 2015 Manual Big Data Education MOOCs in Switzerland: New Media, New Access, New Perspectives? Distance education is nothing new and unknown with its oldest roots reaching back to the 1840s, when Sir Isaac Pitman offered a course by using postcard mailing and the University of London being the first higher education institution to offer distance-learning degrees. The world we live – and study – in today is not only a globalized one, but a more digitally interwoven one. Since the late sixties, computers and the internet are not only evolving our daily lives, our working environments, and our social networking, but also the world of science. The internet itself is an invention by scientists. Though, the impact of that invention – and especially: the reciprocal kickback onto science itself – could not have been foreseen and yet we do not know the scale of the influence. It is proven, that students working with computers using the internet achieve more efficient studies. Nowadays a vast number of scientists are also using social media like Facebook or Twitter in their everyday life. These media were originally invented for another purpose than being used as instruments in science; they were invented for networking and making friends online, spreading news and chatter, organizing and sharing events. Now all of these interactions also happen to be very important in the scientific world and networks. Digital and online education have reached a high level of complexity today. Social media in particular accelerated and changed the way we research. A lot of (personal as well as financial) resources flow directly into the online world. Think for example about the variety of scientists using blogging services or websites like Wikipedia. One of the newest outputs in this overlapping field of social media and science education are so-called MOOCs, standing for Massive Open Online Courses. This report will explain the phenomenon of MOOCs, briefly summing up their advantages and disadvantages, and especially introduce the appearance in the Swiss higher education landscape. Understanding MOOCs means talking about an evolving ecosystem of usually free and interactive online courses, available on an increasing number of provider websites, and often organized by universities worldwide. Open access seems to be the key. MOOCs first appeared in the United States but are now quickly spreading far beyond its borders with many educational organizations offering such courses with a big range of different fields of research. By offering MOOCs you can combine different methods such as uploading videos and articles, launching discussions or letting the participants solve multiple-choice questions or experiments in a virtual reality environment. 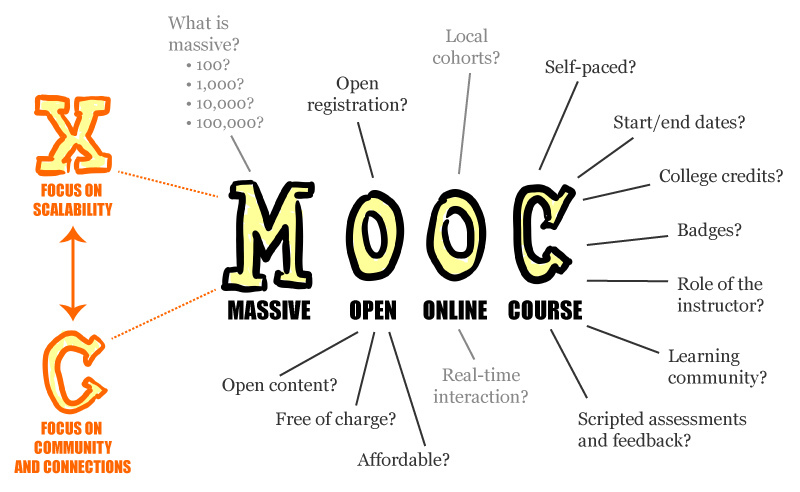 MOOCs are far more than just recorded lectures. They are meant to be interactive and benefit from an electronic network. The aim is to have an interaction between students, teaching assistants, and professors. The first ever MOOC was held by Stephen Downes and George Siemens back in 2008 at the Athabasca University – by then it didn’t cause a sensation. From this humble beginning was the potential for a cascading phenomenon. This took place in 2012, when two big online MOOC platforms were launched, Udacity and Coursera. Already after a few months they were present in over 190 countries covering more than a million users. The numbers rose to more than 2.5 million users by 2013 signing up for more than 215 online courses. But after mentioning all these numbers: are MOOCs really the “next big thing” in the evolution of higher education? It should be mentioned, that between 1999 and 2008 Swiss universities had already collaborated and tested a nation-wide platform called “Swiss Virtual Campus”. The campus goal was to adapt new technologies and promote upcoming e-learning methods. The attempt was interrupted, as individual universities phased out with their own e-learning programs. For instance, since 2003, the University of Basel started with a program called “blended learning”, where traditional lectures were video recorded and then put online. Concerning MOOCs, Swiss universities were sceptic at the very beginning, but to not miss the trend, the Swiss higher education institutes started to supply the market with different forms of MOOCs. The first Swiss university to offer a MOOC was Lausanne’s Federal Institute of Technology (EPFL), offering its online courses on Coursera. The first course (Scala computer programming) already reached about 53 000 students – this was five times the number of students enrolled at the EPFL at the time. Already by autumn 2013, the university planned to offer ten more courses. EPFL was shortly followed by other institutions, such as Zurich’s Federal Institute of Technology (ETHZ). Back in 2013, the cantonal universities of Zurich, Basel or Lausanne did not consider MOOCs a priority – this has definitely changed by now. The percentage of Swiss MOOCs is steadily increasing – with the University of Basel also jumping on the bandwagon. The University of Basel is just about to offer its first MOOC in autumn 2015, working together with the British platform FutureLearn. The Basel MOOCs are produced by the university’s New Media Center, initially working on three courses per year during the test phase. The courses are available on the FutureLearn website and are offered for free and open to anyone interested. The course is offered in conjunction with more than 200 other courses on the website, reaching a registered community of over a million clients. The topics of Basel University’s own MOOCs are orientated on the universities thematic focal areas. These are: Life Sciences, Visual Studies, Nanosciences, Sustainability and Energy Research as well as European and Global Studies. The first courses are “Exploring Possible Futures: Modeling in Environmental and Energy Economics” (economy studies, started 19 October 2015) and “From Ink to Sound: Decoding Musical Manuscripts” (musicology, started 2 November 2015). The University of Basel wants to create and profit from worldwide visibility, but also to promote its course offerings and trigger international educational and students exchanges. Advantages and disadvantages of MOOCs – Why connecting? Considering all of this, MOOCs seem to be the fulfillment of higher education’s desire to reach a new public, to reach internationalization, to be successful and to rank high in comparison to others. On the way there, universities feel the pressure to improve their economics and their productivity. Institutions are interested in generating more money, and to do this they will need to be more visible on the highly competitive higher education market. Are MOOCs the desired or best method and opportunity to achieve these goals? One of the main advantages of online-based education is that the data or content can be cutting-edge. While school books content is outdated from the very moment of its printing, online information can be updated continuously. This currently fluid and updatable nature allows even more information to be connected to actual research and studies on a higher education level. Because of the possibly big number of subscribing students, MOOCs can profit from interdisciplinarity at a yet unreached level. Furthermore, interacting students use these modern methods to collect and transform an enormous amount of data, called “Big Data”. In the field of peer-to-peer learning and big data analyzing, an enormous potential could be released in the future, thus accelerating scientific processes and reaching more transparency. A certain interaction – some called it “web 2.0” or the “read write web” – is already reality, for example, think about Twitter or Wikipedia. With instruments like MOOCs the next step could be from web 2.0 to “science 2.0” or “libraries 2.0”, talking about your around-the-corner library, offering some of the inventory online and connecting it other databases. Students with financial limitations, perhaps students in less developed countries, could enormously benefit from free online lectures. People could even connect to the platforms by using mobile phones, which in Africa are more widespread than personal computers. For self-motivated learners and autodidacts, the possibilities are remarkable. Signing up for a MOOC means gaining a great flexibility as students can learn at their own pace and follow the program whenever they find time. Having a side job can complicate studying at offline universities, but perhaps it is not so with online ones. In addition to that, lectures could be retained online after they are finished, so future generations could still benefit from the material. There is skepticism about MOOCs not being particularly innovative, but just a new marketing opportunity. Time will show whether interdisciplinarity among MOOCs is real or merely a gimmick. There seem to be big differences in who adapts to the new approach in teaching; for example nature science students are more open to such forms as MOOCs than law students. Unanimously there are comments about the often bad quality of online courses, though this description of “bad” varies a lot. Is it because MOOCs are usually free of any fees and thus to little money is invested? Online education surely is not yet capable of replacing colleges. A current big challenge for scientific internet activity is that research mostly is not recognized or accredited, at least on the European continent. One problem could be the measurability of such activity. The only way to measure this activity is in the amount of followers, re-tweets or likes, thus there is no accreditation that takes place. To be rewarded, one must be enrolled at a university – though it could be fully online. One of the biggest challenges to take MOOCs seriously is the completion rates as these are typically very low, somewhere below 10 percent. Should we get rid of big lecture halls at our universities and higher education institutes? With augmented reality or even in virtual spheres, one could think so. Having real-world lectures is more expensive, less efficient, and perceptibly less modern. But what about doing experiments, working in labs, training medical skills on real humans and so on? Virtual learning might surely be a “portal into educational opportunities that […] hadn’t existed before”. However, as it is with opportunities, they come and go and there are always many possibilities. The challenge of being progressively up-to-date in matters of electronic teaching triggers new methods in education which does not necessarily mean older models are outdated. Personal communication, hands-on experience, and human interaction are valuable and not easily replaceable with options in the online world. Nevertheless, MOOCs are indeed a great opportunity to carry the institutions know-how into the big, wide world and advertise their programs. It is a chance for interaction with students abroad and a networking opportunity. Thus, offering and participating in MOOCs has the opportunity to truly enrich the world of Global Higher Education. Tait, Reflections on Student Support in Open and Distance Learning, The International Review of Research in Open and Distance Learning; Simonson, Distance Learning, Volume 2/6 p. 18. Rothblatt, Supply and Demand: The Two Histories of English Education, History of Education Quarterly, Volume 28/4, 1988, pp. 627–644. Bösch, Einzug der Rechenmaschinen, Leibniz-Journal, 1/2014, pp. 13–14. Tochtermann, Interview „Akademisches Gezwitscher“, Leibniz-Journal, 1/2014, pp. 16–17. Breyton, Das klickende Klassenzimmer, Leibniz-Journal, 1/2015, pp. 25–26; Tochtermann, Interview „Akademisches Gezwitscher“, Leibniz-Journal, 1/2014, pp. 16–17. In fact, it is a highly interesting question whether science is transforming the internet or the internet is changing science, see Tochtermann, Interview „Akademisches Gezwitscher“, Leibniz-Journal, 1/2014, pp. 16–17. ‹http://www.netzwoche.ch/000-002-249› (29.09.2015); Jolin, Distance learning taps in to virtual reality technology – As technology advances, so the potential for online learning flourishes, see ‹http://www.theguardian.com/education/2015/feb/19/distance-learning-taps-in-to-virtual-reality-technology› (29.09.2015). Bradley, Swiss universities try to catch the MOOC wave, ‹http://www.swissinfo.ch/eng/free-education_swiss-universities-try-to-catch-the-mooc-wave/34918170› (29.09.2015). Although the University of Lausanne was using other channels since 2009 such as iTunes U, Apples online education platform, together with Yale, MIT, Berkeley and thousands of other popular institutions. ‹https://www.unibas.ch/de/Aktuell/News/Uni-Info/Universitaet-Basel-kooperiert-mit-FutureLearn.html› (29.09.2015); Bradley, Swiss universities try to catch the MOOC wave, ‹http://www.swissinfo.ch/eng/free-education_swiss-universities-try-to-catch-the-mooc-wave/34918170› (29.09.2015). ‹https://www.unibas.ch/de/Aktuell/News/Uni-Info/Universitaet-Basel-kooperiert-mit-FutureLearn.html› (29.09.2015); ‹https://www.futurelearn.com› (29.09.2015); in cooperation with the University of Zurich, Basel was already hosting a MOOC in spring 2015 within the Nordic studies, see ‹https://www.unibas.ch/de/Aktuell/News/Uni-Agenda/Nordistik-Die-Sagawelt-der-Wikinger.html› (29.09.2015). For more information concerning the economics of education see ‹https://www.cesifo-group.de/de/ifoHome/research/Network/Areas/Area-EE-Economics-of-Education.html› (29.09.2015). Breyton, Das klickende Klassenzimmer, Leibniz-Journal, 1/2015, pp. 25–26. Veletsianos/Shepherdson, Who Studies MOOCs? Interdisciplinarity in MOOC Research and its Changes over Time, International Review of Research in Open and Distributed Learning, Volume 16, Number 3, pp. 1–17. Karisch/Schelp, Das grosse Graben, Leibniz-Journal, 1/2014, pp. 20–33; Worldwide data volume by the year 2020 is estimated to be around 40 zettabytes. If every single byte represents one grain of sand, the number would overbalance planet earth’s resource on sand about 57 times, see Karisch/Schelp, Das grosse Graben, Leibniz-Journal, 1/2014, pp. 20–33. Laurillard, Big data can transform learning – as long as lecturers take control, see ‹http://www.theguardian.com/higher-education-network/blog/2014/jun/03/big-data-transform-university-learning› (29.09.2015); Tochtermann, Interview „Akademisches Gezwitscher“, Leibniz-Journal, 1/2014, pp. 16–17. Karisch/Schelp, Das grosse Graben, Leibniz-Journal, 1/2014, pp. 20–33; Kaltschew, Ich klicke, also bin ich, Leibniz-Journal, 1/2014, pp. 18–19. Anderson, Out of Africa: e-learning makes further education a reality for tens of thousands, see ‹http://www.theguardian.com/global-development/2015/may/20/elearning-africa-conference-addis-ababa-further-education› (29.09.2015). Youngberg, Why Online Education Won’t Replace College – Yet, see ‹http://chronicle.com/article/Why-Online-Education-Wont/133531/› (29.09.2015); Kolowich, Conventional Online Higher Education Will Absorb MOOCs, 2 Reports Say, ‹http://chronicle.com/blogs/wiredcampus/conventional-online-higher-education-will-absorb-moocs-2-reports-say/52603› (29.09.2015). MOOC Completion Rates: The Data, see ‹http://www.katyjordan.com/MOOCproject.html› (29.09.2015); Big (MOOC) Data, see ‹https://www.insidehighered.com/blogs/stratedgy/big-mooc-data› (29.09.2015).